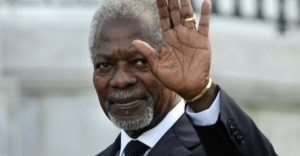 The family of late Kofi Annan , former United Nations’ Secretary-General, has officially confirmed the death of their beloved but has asked for privacy to mourn him. “The family kindly requests privacy at this time of mourning,” a statement from his foundation stated. The former UN Secretary-General passed away today, Saturday, August 20187 after a short illness at a Hospital in the Swiss city of Bern. The family said arrangements to celebrate his remarkable life would be announced later. Kofi Annan was a global statesman and a deeply committed internationalist who fought throughout his life for a fairer and more peaceful world. During his distinguished career and leadership of the United Nations, he was an ardent champion of peace, sustainable development, human rights and the rule of law. Wherever there was suffering or need, he reached out and touched many people with his deep compassion and empathy. He selflessly placed others first, radiating genuine kindness, warmth, and brilliance in all he did. He will be greatly missed by so many around the world, as well as his staff at the Foundation and his many former colleagues in the United Nations system. He will remain in our hearts forever. The Kofi Annan Foundation mobilizes political will to overcome threats to peace, development and human rights.